By doing most of the labor yourself see how you can build your own cabin for around half the cost of buying on the market. See how we saved over $100,000 in building our own cabin. This free information site will step you through each phase of cabin or home construction from surveying the lot to making your own countertops. I've included documentation of this cabin project as well as additional Do-It-Yourself (DIY) information on each construction topic. This cabin was built in Garden City, UT (Bear Lake) as a family project. From start to finish the cabin took approximately 9 months to build (May 2009 to March 2010) with 3 of us working every weekend. The cabin is about 3000 sq ft finished and also has a good size garage in the basement. This website includes basics on construction costs, framing, geothermal heating, electrical wiring, footings, and windows to name a few. Once you see what is required to do each of these, you will be better equipped to try it yourself. Fortunately each of the owners in our project had expertise in different areas that they could contribute to the project. One owner was a general contractor/framer, another had experience with plumbing, and I had the background to do the electrical wiring. This made our project go fairly smooth but with a little research and a do-it-yourself personality, it is possible to tackle nearly any aspect of construction yourself. Building your own cabin is very rewarding and creates a place to get away from everyday life and enjoy some time with your family. Depending on how much you use the cabin yourself, you can often rent your vacation home to recoup a lot of your investment. We have done this and had great success. Nightly rentals, mostly in July and August, at the cabin generate about a10% annual return on our initial investment. After maintenance and utilities that number is closer to 7% - still relatively good. See our latest project, Solar Power for the Cabin. Unlike most solar installations which can take years to recoup your initial investment, I'll explain how we installed a 10KW solar system for basically free and immediately started saving money on our electric bill. Thanks for taking the time to visit and support my website. We get about 3,000 visitors a day and are growing fast. 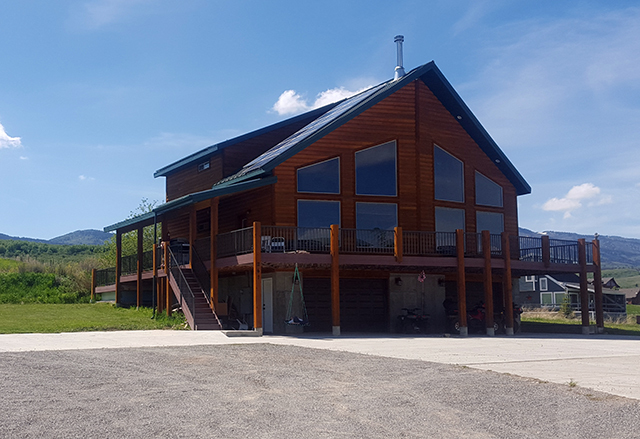 At first this website was intended to merely document our cabin building experience but since that time I have added bits and pieces of content and our viewership has grown dramatically. Have fun learning as we have and remember the more projects you do youself the easier they become. Sorry, I know the website would look cleaner without the advertisements but that's what makes the $$$ and makes the next project possible!